When we leave our loved ones in a nursing home we expect that they will be properly cared for. Sadly, that is not always the case. Sometimes nursing homes fall short of providing the care that is expected. Nursing home residents often suffer injuries due to neglectful care. One common medical problem that happens to elderly people in nursing homes is the appearance of pressure ulcers. 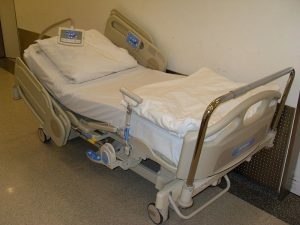 Pressure ulcers, also known as bedsores, are often a sign of nursing home neglect. Pressure ulcers are red sores that are caused by something that rubs against the skin on a continuous basis. They most commonly occur in the elderly and those who are bedridden. The sores form on areas of the body that are in contact with the bedding, such as the heels, tailbones, and elbows. The sores are painful, and if allowed to worsen, can be difficult to treat. Pressure ulcers begin as small red marks but can quickly worsen. Stage I and II pressure ulcers are the mildest, but can still be painful. Stage III bedsores are those where the wound deepens and breaks the skin. Stage IV pressure sores have deepened and become infected. In some cases, these sores can go all the way down through the tendons to the bone. If they become infected, the sores are quite difficult to treat, and the infection can spread and become life-threatening. The quick diagnosis and treatment of bedsores is essential to their successful treatment. At the first sign of bedsores, the patient should be examined by a doctor. The doctor should provide a treatment plan, which must be followed in order to keep the sores from worsening. If a bedsore becomes an open wound, it needs to be kept clean and sterile. If an infection occurs, it must be treated immediately. Because older individuals often have a compromised immune system, an infected bedsore can become life-threatening. Nursing home staff members must take care to prevent bedsores from occurring. Bedridden patients require repositioning on a regular basis. Those who are at high risk for bedsores should be identified and special care given to keep them from occurring. Caregivers must be taught how to identify bedsores, particularly in their early stages. If a bedsore begins to develop, prompt medical treatment should be sought. All too often, improper care leads to the development and progression of bedsores. Pressure sores can cause an overall health decline, and if an infection spreads, the patient could suffer organ damage and death. Nursing homes need to have enough staff members to properly care for all patients, especially those who are bedridden. If your loved one suffered from pressure ulcers while at a nursing home, he or she may be the victim of nursing home neglect. Call the legal team at Brod Law Firm to review the details of your situation and determine how to proceed. Call us today at 800-427-7020 to schedule a consultation.